Introduction: The economic and social factors which made conflicts between China on the one hand and the pastoral empires of Mongolia on the other almost inevitable did not normally favor westward expansion. The Mongol conquest of western regions – including Iran and Eastern Europe – may be regarded as a by-product, as it were, of personal ambitions, of mistakes made by rulers of limited abilities, of armies left to their own devices to determine their course of action. In what follows, an attempt will be made to present the main features of Mongol history in the West with a minimum of digressions. This is a field which has been tilled over and over again by scholars good and bad, in voluminous books and short articles. It has been my feeling for a long time that a short, straightforward narrative may be needed, one that can be used for general orientation while, at the same, containing sufficient new material and views to warrant publication in a scholarly periodical. It will be up to the readers to judge whether either of these aims has been achieved here. 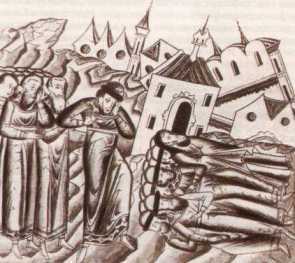 The disintegration of the Karakitai state can be set in 1218, when the fleeing Naiman Kuchlug, who for almost a decade had been its effective ruler, was killed by his arch-enemies the Mongols. The aim of the Mongols was not the destruction of the Karakitay state but the punishment of Kuchhug, but the move brought them into contact with the bellicose ‘Ala’ al-Din Muhammad II Sultan of Khwarazm (1200-1220) who in 1218, completely misjudging Mongol power, made the fatal mistake of murdering Mongol envoys, an act always abhorred by the peoples of Inner Asia. The Mongol punitive expedition set in motion that same year led first to the conquest of Transoxiana, then expanded to include Afghanistan and Eastern Iran. The arrogant folly of Muhammad, who was thinking of conquering China, was backed by neither statesmanship nor by adequate military abilities. With his senseless presumption he had made the caliph his mortal foe, dividing thereby the Muslim world on the eve of the Mongol attack; as a poor strategist, he failed to make use of the numerical superiority of his army. As far as any individual can be held responsible for historical developments, the guilt of Muhammad of Khwarazm in bringing about one of the great disasters of human history is beyond doubt. The effects of the Mongol attacks were literally devastating. The complicated system of irrigation was badly damaged, fertile land was turned into desert; the bleak, cheerless regions of Iran and Turkestan still bear witness to the terrible thoroughness of Mongol destruction.